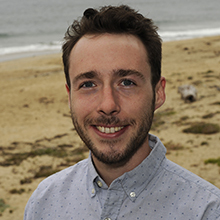 Joseph Warren is a research technician in Yui Takeshita’s Coastal Biogeochemical Sensors Group. Joseph earned an M.S. in chemical oceanography, from the University of Connecticut, Avery Point where he conducted chemical oceanography analysis for seasonal cruises as a graduate student researcher. Prior to joining MBARI, Joseph designed and conducted experiments on passive sampling devices at the University of Connecticut, in addition to working as an apprentice plumber and field manager with Warren Brothers, a mechanical contracting business.